I brought these bliss balls to a women's event recently and they were a huge hit! They also make a super easy snack packed full of zesty lemon, healing ginger and delicious cashews. 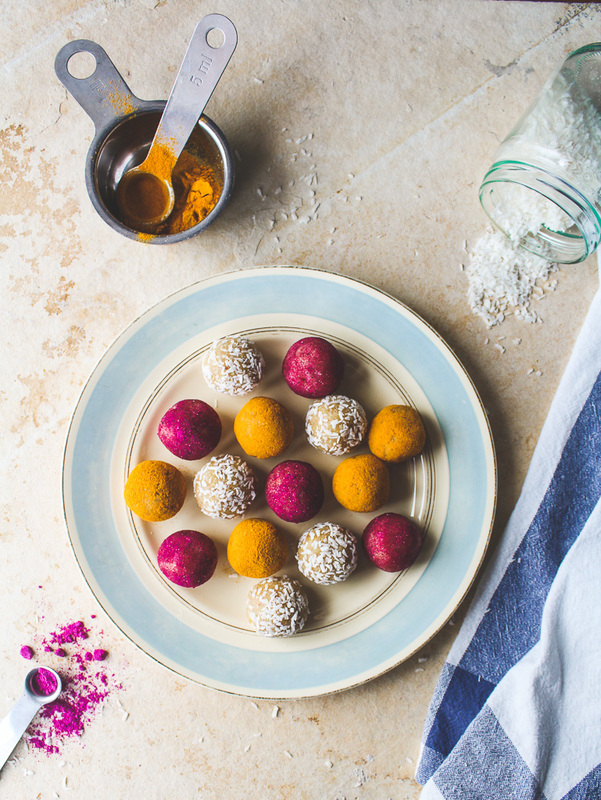 Roll the balls in ground turmeric, dragonfruit powder and shredded coconut for different colours, or just choose one or two! Keep one or two bliss balls on hand for that afternoon snack or post-sweaty yoga session. Grate the ginger, zest the lemon and squeeze the juice. Reserve ¼ cup shredded coconut in a shallow dish for rolling. Place remaining coconut in a food processor with the cashews, dates, ginger, lemon zest & juice. Process until fully combined. I chose to roll my bliss balls in 3 different ingredients for a variety of colours. But just choose whatever suits you! Add a few bliss balls to the shredded coconut in the shallow dish and roll around to coat them well. Clean the dish and do the same with the turmeric, and then afterwards with the dragonfruit powder (for the pink colour), if using. Place bliss balls on a baking sheet and in the fridge to set for a couple of hours. And then enjoy! Bliss balls will keep in the refrigerator for about a week and in the freezer for a few months.